Late in 1999 we launched a business intented to help commercialize new products designed to pollute the environment less...to help us become less dependent on costly fuels that should not be burned as we have done since the stone ages. As the world's supply of oil dwindles...as water and air pollution reach unacceptible levels of contamination and create evidence of accelerated, adverse global warming effects...our company would like to do its part to change things for the better! We have begun to partner with companies in the USA and other parts of our "global village". In time, more flags will represent electroportal's efforts, as team-work is essential for practical manufacturing and wide distribution of these new products! Though we still need cars, trucks, buses, trains, boats... to move people and materials, do we need to use our car for short trips in good weather? As gasoline prices climb, as commuter grid-lock becomes worse, as parking becomes impossible...bicycles and other specialized vehicles will make more and more sense! Parking regular vehicles in cities is expensive, or just impossible! 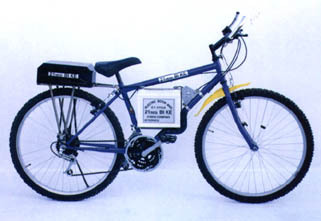 In 2000, we began working to provide higher powered electric bikes for hilly areas such as our San Francisco neighborhoods. Streets with less traffic are often steep, discouraging bike use for all but the olympic athlete. Methanol powered fuel cells, as described above, could eventually be the source of electricity for a new city bike. Until then, only light weight batteries will help make high powered electric bikes a reality. Last year we discovered the Charger pedal-assist e-bike to be the most functional design for hills and longer range--given the current state of light weight battery cost and availability. We were truly fortunate to be able to purchase It also encourages us to use our muscles, depending on each and everyone's capability. We came to realize last year, until light weight battery options are cheaper and more available, the Charger pedal-assist design is quite functional for hills...offering longer range as well. This design helps you become fit and stay fit by pedaling--according to each and everyone's capability. we were very fortunate to have been able to purchase over a thousandCharger e-bikes to pass on to our customers at significantly less than they cost to produce! In our opinion these bikes are the most functional e-bike alternative for anyone living in hilly terrain...until light weight premium batteries (and the required chargers) become available at a price most people can afford. In the mean time we will continue to take an active role in developing functional, light weight electric personal transportation. But you don't have to wait for many products we now offer! Evercel batteries are but one of many green products available today! You no longer have to wait for a growing list of products that are affordable today! We'll offer specials from time to time. Ask about dealer opportunities or how to take part in VOLUME PURCHASES. Please tell us your needs and we will try to help you find solutions! Cooperatively, we may make it happen! This page was designed and built with EZ-NetTools . In less time than you might think, this page was added to our web site. The complete package of page building, shopping cart, web promotion, (and dozens of other e-commerce programs) allows small companies to design and maintain their own sites...with no HTML programing experience.